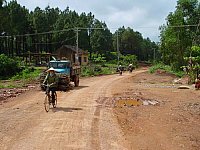 In the early 2000, the Communist government in Hanoi decided to construct a highway, the HCM Highway, along the Truong Son Range to connect North Vietnam with South Vietnam, parallel to the existing Highway 1 in the coastal areas of Central Vietnam. The construction is going on, and would be completed in four years if everything goes as planned. 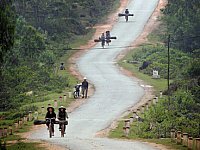 Prompted by tales of the formidable HCM Trail, many journalists and observers outside Vietnam quickly adopt the false notion that the new highway is built on the Ho Chi Minh Trail, or the Trail is reborn and rebuilt as HCM Highway, without giving it a second thought. 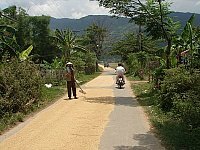 The HCM Trail was a complex of parallel truck routes and foot paths. Most convoys departed at three major loading areas inside North Vietnam's panhandle region and began their journey by heading to the Laotian borders, following the three paved highways built before 1945 by the French colonialist authorities in Indochina. 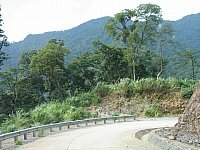 All the three roads connect the Vietnam's provinces of Nghe An, Ha Tinh and Quang Binh with the Laotian road network across the common border. On April 5, 2000, Hanoi government held the ground breaking ceremony at a ferry harbor in Quang Binh province, to launch the construction of the HCM Highway. The Xuan Son ferry harbor was one of the three starting points of the HCM Trail (the southernmost part of North Vietnam, close to the 17th Parallel. See the map). The extreme large quantity of rice from North Vietnam was transported on the HCM Trail to the hundreds of logistic bases in South Vietnam border areas to support North Vietnamese combat units. Much of it was kept in storage houses and quickly perished by humidity and bombing. 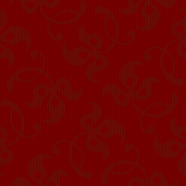 More rice would replenish the stores. That was the reason why North Vietnamese peasants had to pay tax and fulfil many obligations that took away about 70 to 80 percent of their crops during the war. It seems that such realities have not been taken into consideration in many studies and researches on the Vietnam War, but false reports like those on the location of the HCM highway are accepted easily. That's one of the most disastrous problems of our time.